Every time I visit the architectural treasure trove of Ypsilanti, Michigan, I’m met with atrocious weather. Once when I came to visit Eastern Michigan University as a high school senior, EMU had a snow day. I was relegated to a pool hall for the day until my mom could pick me up hours later. Of course, I wasn’t sold on the school, having not seen much other than the empty student center and a strangely proportioned water tower, and yet I’m left with the feeling that I might have enjoyed calling Ypsi home for four years (queue the Iggy Pop). Today’s weather was no different, but we couldn’t hunker down without some tourism first. Ypsi’s architecture captures an age of seemingly prolonged prosperity spanning from the Civil War to WWII, and includes impressive collections of Classical, Georgian, Romanesque, Italianate, Victorian, Shingle Style, and Arts & Crafts revival and period architecture. 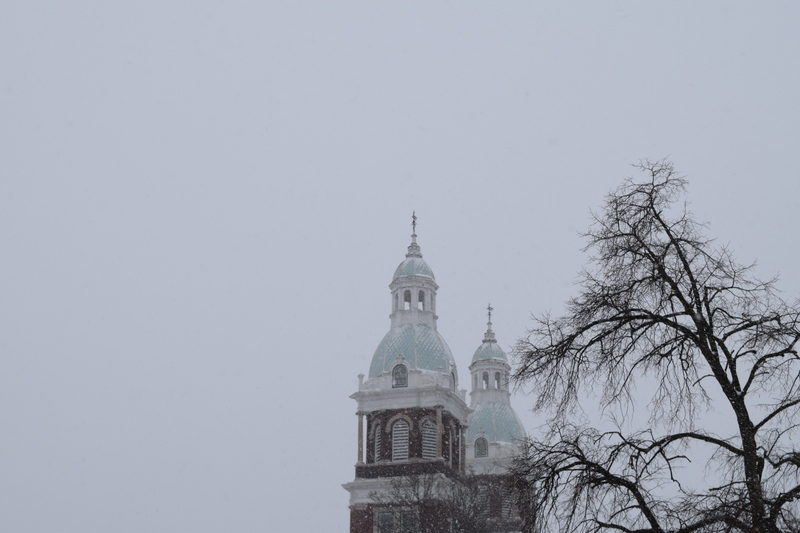 Even through the snowstorm, Ypsi read as one of the most complete and coherent historical cities in Michigan. Although Ypsilanti represents a living collection of historical neighborhoods rivaling Michigan preservation towns like Grand Rapids, Marshall, and Mackinac Island, a figurative soot lingers on the City’s surfaces to remind the tourist of his whereabouts. Ypsi is a small, blue-collar college town in the shadows of Ann Arbor and Detroit – Michigan’s Cambridge and Gotham, respectively. It’s as if all of the City’s pristine Victorian Painted Ladies, complete with their tracery, fretwork, and poly-chrome mannerism, are obliged to disclose that they are also reasonably haunted. But while some baseline menace may be measurable, one should rest easy. In the case of Yspilanti, darkness and romance pair beautifully. This town smokes Marlboro Reds and has Y-P-S-I carved into it’s knuckles, but it’s also a lovely travel stop for friendly company, lively conversation, endless historical cataloging, and a Coney Dog. Memento Vivere //// Nick Rolinski Create a free website or blog at WordPress.com.